I recently bought a Logitech Business Mouse but when I plugged into my desktop (running Gentoo Linux) it was running at ludicrous speed. 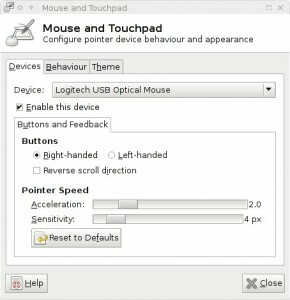 When I opened the “Mouse and Touchpad” UI and tried changing the Acceleration down from 2.0 to 0.1. This made the mouse better but I didn’t like how it felt. I cant really describe what was wrong with it. which slows down the 800dpi to be closer to my older mouse. This meant the mouse was working the same my old Dell one but it wasnt being remembered after a reboot. 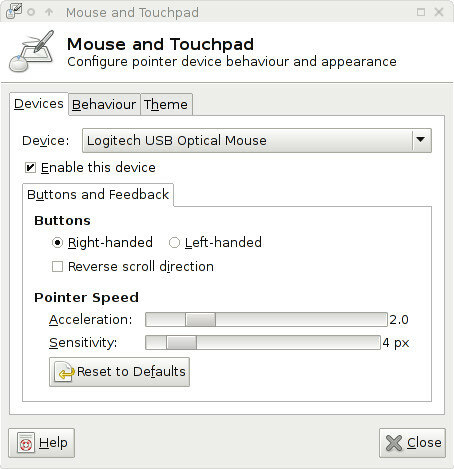 Identifier "Logitech USB Optical Mouse"
MatchProduct "Logitech USB Optical Mouse"
This entry was posted on Tuesday, January 6th, 2015 at 4:54 pm	and is filed under Linux. You can follow any responses to this entry through the RSS 2.0 feed. You can leave a response, or trackback from your own site.